The Lincoln Stars will take on arguably the hottest team in the USHL this weekend with a home-and-home series against the Tri-City Storm. Friday night's game will take in Lincoln at the IceBox, while the Saturday evening game will take place at the Viaero Event Center in Kearney. Puck drops at 7:05pm CST for each contest. If you're unable to attend either of the two games this weekend, you can follow the boxscores online via Pointstreak, listen to Stars radio announcer Mike Melbye on 93.7 FM "The Ticket," or watch the games live on FASTHockey for a fee. 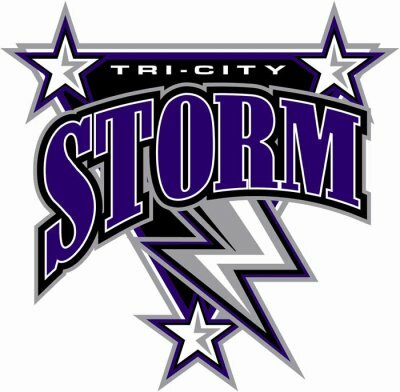 The Tri-City Storm enter this weekend with a record of 26-11-5 (57 points) good enough for second place in the USHL western conference, three points behind the first place Sioux City Musketeers. The Lincoln Stars are in last place in the western conference with a record of 13-23-5 (31 points). Click here to view the current league standings. The upcoming weekend series will be the fifth and sixth times that the Stars and Storm will play one another this season. These two teams will meet a total of 8 times in the 2014-15 regular season. Tri-City is 4-0-0 in the four prior meetings with Lincoln this season and have outscored the Stars 15-6. In their last two games against Tri-City, the Stars have been outshot 100-37. You aren't seeing things. 100-37 in two games, both losses, obviously. Amazingly, the Storm only scored a total of 9 goals in those 100 shots on net. As has been the case all season for Lincoln, goaltenders Cam Hackett and Peyton Jones have stood on their heads and kept the scores from getting too out of control. As I mentioned above, the Storm are definitely one of the hottest teams in the USHL right now. In their last 13 games played, Tri-City has a record of 12-1-0. Meanwhile, the Stars are 2-10-1 in their last 13 games played. Polar opposites. As for the Stars, they made a roster move this week when forward Joe Lappin was traded to the Des Moines Buccaneers. Per this tweet, the Stars acquired forward Christopher Dodero, a 1st round Phase II pick in return for Lappin and a 4th round Phase II pick that the Stars originally acquired from Waterloo for Blake Christensen. Dodero of course was acquired by Lincoln from Muskegon earlier this season before he was sent to Des Moines. I know there are some fans out there wondering why the Stars would trade away one of their top point producers when the team is really struggling and can't seem to buy a win. To put it simply, it's a smart move right now for the Stars to unload players who aren't going to be in the USHL next season for younger player and/or draft picks that can be used to rebuild for next season. It hurts right now, but it should pay dividends next season. The USHL trade deadline is March 2nd, so you will likely see more of these kinds of trades from teams who aren't going to make the playoffs. There are teams out there fighting for a playoff spot who could use good players from bad teams, even if it's just for the final third of this season only. Right now, it's a sellers market, so teams like the Stars are able to get a positive return for a player that wasn't going to be here next season. Trading some of the older, college-bound players also gives some of the younger players on this team to get more ice time, and hopefully in turn build more confidence that will carry over to next season. It also allows teams like the Stars to call up some of their affiliate list players (prior draft picks) to give them a taste of the USHL before they return next season to Lincoln to be full-time players. Hopefully that makes sense. I know the fans can sometimes form a close bond with these players, but junior hockey isn't Candyland. Players get traded. Teams are always looking to what they can do to get better right now, or looking ahead on how they can get better for next season. It would not surprise me at all to see the Stars make more moves before the March 2nd deadline to build further for next season. You put it very nicely Yeti. It can be distressing to a degree to have your favorite player(s) traded away. A lot of us tend to look upon the boys as our own sons, grandsons or nephews in a way. But we as fans have to continue to support those who are still here and look towards the future ourselves. As for this weekend, it is gonna be a tuff one for sure. TriCity is much improved over past years. It will take a maximum effort by the boys to earn a couple of points. I personally don't have a problem with the Stars making trades at this point. Yes, it's tough to see some of my favorite players shipped off to other teams, but you know what?....we're not going to make the playoffs this year--to prepare for next season is in the best interest of this team. I only wish the Stars organization was a little bit more forthcoming with providing details of these trades (maybe thats not possible?). For example, awhile back, we traded a couple of our players but received no info as to what we got for them in return. We also have picked up players from other leagues without details. Now this week, we trade a player to get back a guy we traded away only last month (plus a draft pick). I'm not saying this was a bad trade, (there's probably alot more to it), but it would be nice to know some details. It would be nice to know just how many draft picks we've accumulated so far.--I would think at some point the Stars would have to look closely at the option of bringing in proven USHL players rather than acquiring more draft picks. If anyone else has opinions or comments on this matter, I'd love to hear them. Good points. I think there is quite a bit of background information with these trades that isn't released to the public for whatever reason. A lot of times draft picks all of a sudden appear for a team on draft day. I'm not sure why the information isn't released to the public, but I've seen it happen quite often. And like you mentioned, extra draft picks can be used to trade for experienced, quality players. A lot of times you'll see those kinds of trade made right before the two USHL drafts. sounds crazy, but i don't know if i've ever seen that many visiting team fans at the Ice Box before. even when we've played Omaha and had a number of Lancer fans come down, i don't think we ever had that many. luckily, all the Storm fans in our section were very nice and we had no issues. great game and win last night, let's do it again tonight! Go Stars. I know the weekend's only half over and we still have another game with these guys, but..........HOW 'BOUT DEM STARS BABY!!! Still super excited and proud of the way our boys played last night. Things didn't go our way for the whole game (our 5 min. power play comes to mind), but overall I thought 5 on 5 we were the better team. Loved the effort. Full 60 min. game and NO 2ND PERIOD MELTDOWN. Really hope this type of play continues, these boys pour their heart and soul into the game and it's just so great to see them rewarded for it. its pretty easy for away fans to get a ticket now days, sadly the stars are not the hot ticket in town anymore.